The John Hancock Committee' Makes a Feeble Attempt to Answer the Question: "If the Federal Government Ignores the Current Constitution, Why Would They Adhere to an Amended Constitution?" The John Hancock Committee for the States (JHC) gives numerous justifications (excuses) for why the federal government cannot seem to follow the current constitution. (Again, failing to note the states are guiltily of such as well.) In short, JHC excuses could be summed up by saying the Framers were inexperienced, naive, simpletons who had no clue as to the (real) nature of mankind. It is called by many names: Constitutional Convention, Con-Con, Convention of States, Article V Convention. But just because we can have one, doesn't mean we should have one. In fact, the opposite is true. Fox News recently published an article in their Politics section entitled "States' rights advocates eye convention to bypass Congress, amend Constitution." 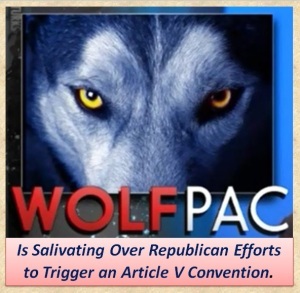 As the title implies, the article discusses the efforts by what they refer to as "States' Rights advocates" to call for a "convention of states." Right out of the gate, the deception begins--be it intentional or simply due to ignorance and lazy reporting. With all of these references to the states, you would think that an Article V Convention (as it is most precisely called) is controlled by the states. However, this is not the case. MoveOn.org co-founder Joan Blades and Tea Party Patriots/Convention of States co-founder Mark Meckler have been working on a "grand bargain" for years. Progressive groups and leaders are working hand in hand with "conservative" groups to promote a rewrite of our federal Constitution. Some "conservatives"[i] like Mike Farris and Kris Kobach deny this reality, but other "conservatives" flaunt it. Backing both sides are the Progressive and “conservative” billionaire boys’ clubs. What does this tell us and what does it tell us about those who deny it is going on? It appears what is in the works is a Progressive/moderate-establishment Republican compromise. "Hope and Change" or "Faith and Courage"
NOTE from Patriot Coalition: Trappers often use a carrot to lure unsuspecting bunnies into the rabbit trap. The below article was understandably scrubbed from the Convention of States Project website after we published our Article V Mythbuilders video which included a citation from the below article. HJR-50 "The Parental Privileges Amendment"
House Joint Resolution (HJR-50) The Parental Rights Amendment (PRA) should be called the Parental Privileges Amendment. Michael Farris, the Convention of States Project Director doesn’t like talking about the specifics of his proposed amendments to grassroots groups when he is wearing his Convention of States Project director hat, but when Mr. Farris dons his ParentalRights.org hat he’s been vigorously promoting the PRA in testimony to Congress , and “encouraging state legislative resolutions” which would grant the federal government control over your kids. Yes, he sells it as a protection of parental rights, but don’t let the title fool you. The Patriot Act has nothing to do with patriotism, and the Affordable Care Act has nothing to do with making healthcare affordable. (INDIANAPOLIS, June 16, 2014) State legislators from across the country converged on Indianapolis last week for the second formal meeting of the Mount Vernon Assembly at the Indiana State House to advance efforts to trigger an Article V “Convention for proposing Amendments” to the U.S. Constitution. Click here to visit our projects page. Click here to join Patriot Coalition.